An opportunity to enjoy a week painting in various Mediterranean locations with expert tuition, encouragement and guidance from Liz Balkwill. If you are interested in further information, then please contact Liz. Private workshops, courses and individual tuition in Portraiture, Life painting and in Oil and Pastel techniques for both individuals and Art groups are available. During the summer there is an opportunity to spend a day painting on location in Norfolk/Suffolk. The locations are carefully selected for their character and their challenges. In the past years they have included the picturesque fishing village of Southwold with its boats and estuary views; the pretty cottages and village green of Heydon; and the historical town of Reepham with its colourful and old churches, pubs and tea houses. If you are interested in attending any of the private workshops and/or painting on location days then please contact me. 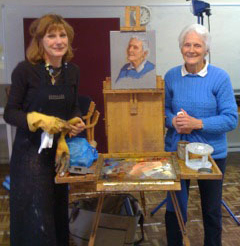 Oil or Pastel Portrait and Still-life demonstrations are given regularly to local art groups, clubs and societies. To arrange a demonstration please contact me.